Much as I would like to post a picture of Oxford covered by the light snowfall that we had overnight, by the time I got into the city it had mostly melted! However, the snowy conditions did put me in the perfect festive mood for visiting the Oxford Christmas Market. 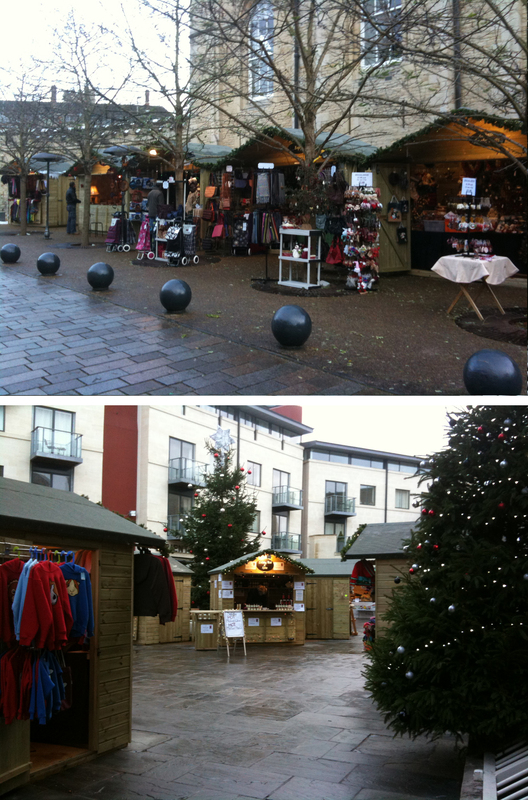 Now in its second year, the market has expanded across the Oxford Castle site with stalls housed in attractive wooden kiosks nestled among Christmas trees, where you will find a variety of Christmas gifts and decorations, a beautiful carousel and warming treats in the refreshment area. Among the gifts my favourites were Crystal Selection, who have some very beautiful and sparkly jewellery made with Swarovski crystal; Orchard Pig Cider Bar, where I warmed up with a cup of hot mulled apple juice with a shot of brandy; and Chou Chou Nuts Over You whose caramelised cashews are a very tasty treat! You will also find stalls selling beautiful silk ties, various wooden crafts, painted wooden children’s toys, bags, scarfs, soaps, festive German foods and much more! German style Christmas markets are becoming gradually more popular in the UK and I really hope that the Oxford one continues to grow and prosper, as it’s a very pleasant and sociable way to shop (an event can be made of it with family or friends) and it brings forth many beautiful gifts and ideas that you may otherwise miss if restricted to just the generic high street. It’s also a lovely way to end a day of busy Christmas shopping in the city; wander along to the market, grab a mulled cider and browse the pretty stalls.